This is one of a series of Player Q&A's for the Sioux Falls Storm. This Q&A was submitted to all 10 IFL teams. We will post those which we have received periodically throughout the season. Thank you to Storm Director of Media Relations for assisting in bringing this feature to our readers. Photo courtesy Sioux Falls Storm. Graphic by David /SCtoC. Data input by Monika /SCtoC. Melvin Owens is a 6'4", 330-lb. rookie offensive lineman who signed with the Storm prior to this season. He played his freshman and sophomore seasons at Mississippi, where he started 22 games over those two seasons. 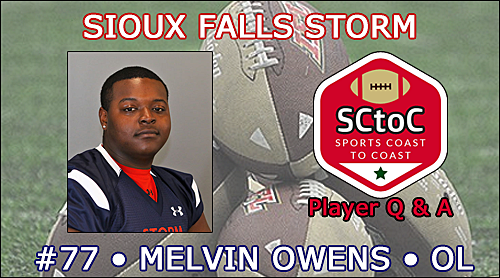 Owens is part of an offensive line which has given up just a single sack through the Storm's first two games of the season. Originally from Alabaster, Alabama, Owens has two brothers and a sister. Per the Storm's bio, he enjoys reading, fishing and doing community service. The following are Owens' answers to our questions. Signing a full football scholarship. I was nervous but very intrigued. Determined to get the job done. Pure ambition was main push to go ahead and try out. Many said I couldn't, but I'm proving them wrong every day. My father has definitely been my biggest inspiration. As of now, I'm just grateful to be here, but ask me again next year. I want to win an IFL championship. I'm looking forward to my rookie season and accomplishing goals I never thought possible. My family has been my sole why to what I do. Nothing short of amazing and supportive; especially my mom and dad. The simple fact that I refuse to live a life of what ifs! That I'm a humble guy excited to be here, and that I'm here to win. Seeing the glimpses into these players thoughts really help bring the game a little more to life. These guys are so humble and opportunity that you can really see their dedication.